Hello autumn! My favourite season - and no, I’m not just jumping on the #pumpkinspice #autumnleaves bandwagon. For me, autumn spells a return to routine (this is not really the case now that I’m a fully grown adult, but you know - old habits die hard), a new spread of incredible season produce to cook and bake with, my birthday (gulp), and our upcoming holiday to Sri Lanka. Exciting! Any tips or recommendations for the later would be gratefully received, especially if they involve anywhere that I can get my mitts on delicious Sri Lankan food. But I digress. The cooler temperatures and darker evenings still feel charming to me at the moment, especially when I get to spend them tucked up in our kitchen trying out new recipes. We’ve been eating a lot of meat-free recipes recently, and tahini has become an essential ingredient to have to hand. We’ve been drizzling tahini lemon dressing over whole baked cauliflower, coating sweet potatoes in it and stirring through soups and risottos. Too good. 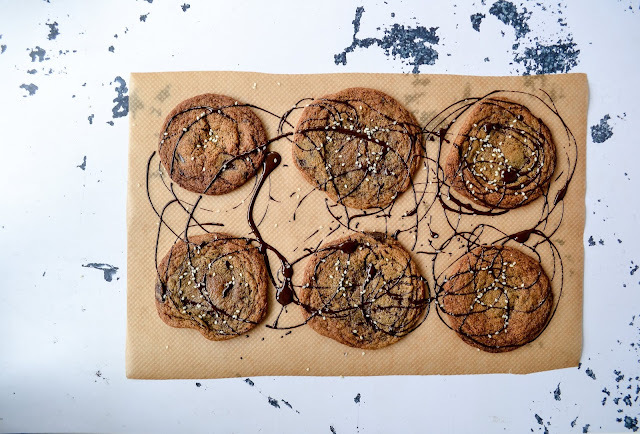 The use of tahini in baking has an established pedigree (Ottolenghi, anyone? ), and for good reason too. It has the textual quality of a nut butter with the slightly bitter tang of sesame, which works perfectly with chocolate. Put them in a cookie and expect gooey, buttery deliciousness. 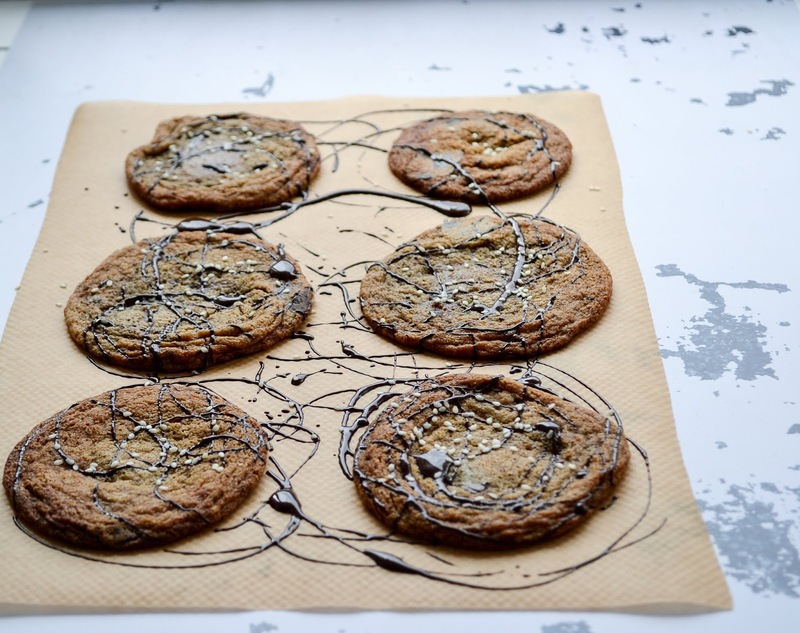 Gooey cookies are the best kind (in my opinion, anyway), but can be tricky to bake smoothly. The soft centre and melted chocolate chips are prime candidates for sticking to baking paper - which is nobody’s favourite. 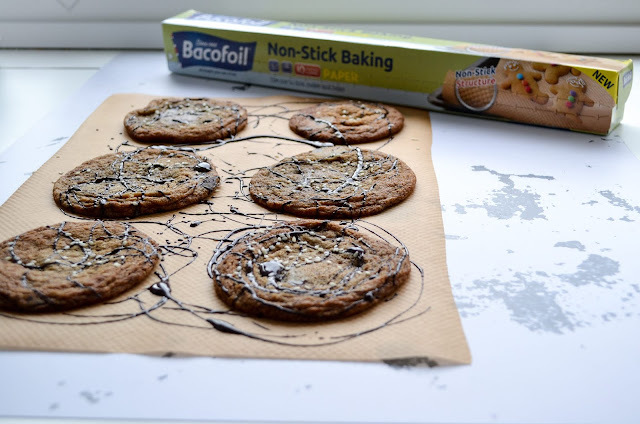 So when Bacofoil® challenged me to test a notoriously sticky product on their Non-Stick Baking Paper, I was all ears! For anyone wondering how this works, let me enlighten you. The paper has an innovative and unique non-stick textured surface. The little dimples mean there is less surface area in contact with the food, allowing it to bake more evenly and preventing sticking. I put the Non-Stick Baking Paper to the test vs regular baking paper AND an unlined tin. I think the results speak for themselves! 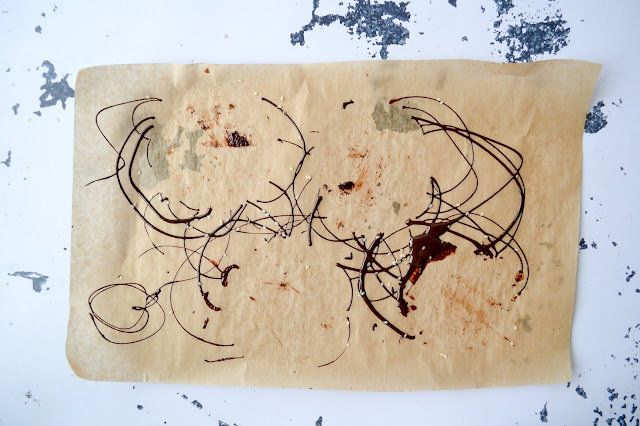 The cookies slid off the Bacofoil® paper like a dream. The regular paper - not so much. 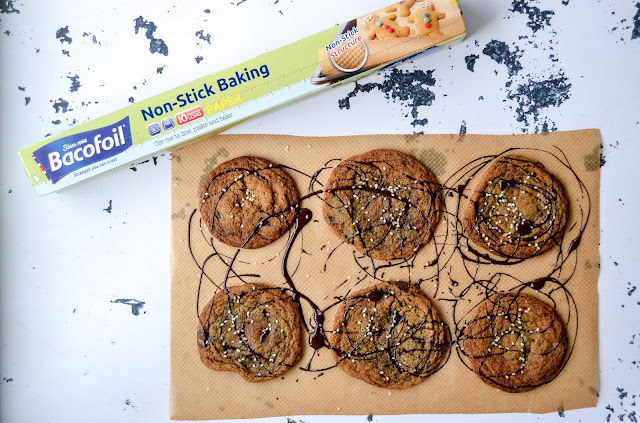 Sticking, stuck chocolate chips and even one sad broken cookie (I wasn’t so sad about that but, you know). The unlined tin was a similar story (*sigh*). In short, the Non-Stick Baking Paper is a dream to bake with, and makes this recipe that bit easier - which is always a win in my eyes. 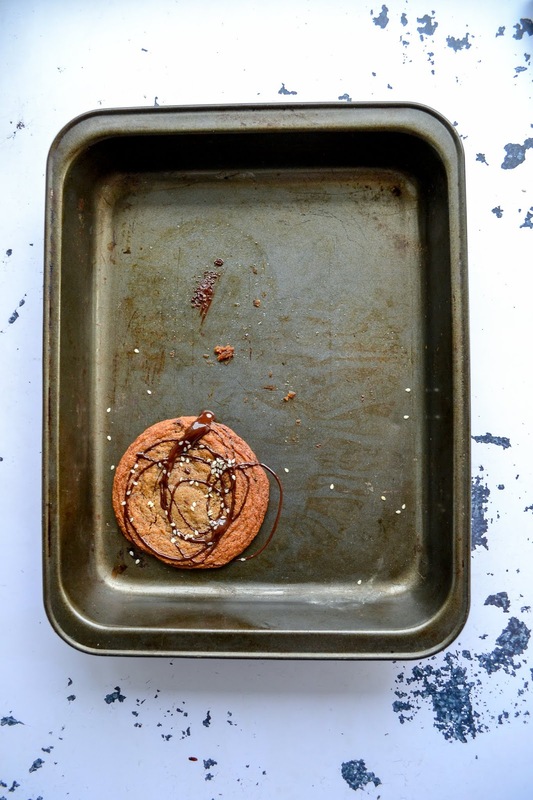 Line two baking trays with Bacofoil® Non-Stick Baking Paper, and heat the oven to 180°C. Cream together the softened butter and sugar. Once fluffy, beat in the egg and vanilla. Scape down the sides of the bowl and beat again until well combined. Separately, whisk together the flour, bicarbonate of soda and fine sea salt. Add to the wet mixture, and mix to combine. Stir through the tahini. ut. Sprinkle with a little flakey sea salt, then bake in the oven for 8-11 minutes - the cookies are ready when well spread, and the edges have browned but the centre is just cooked. You will need to bake the cookies in several batches (the paper can be re-used). Cool the cookies on the trays. Melt the remaining 40g dark chocolate, the drizzle over the cookies. 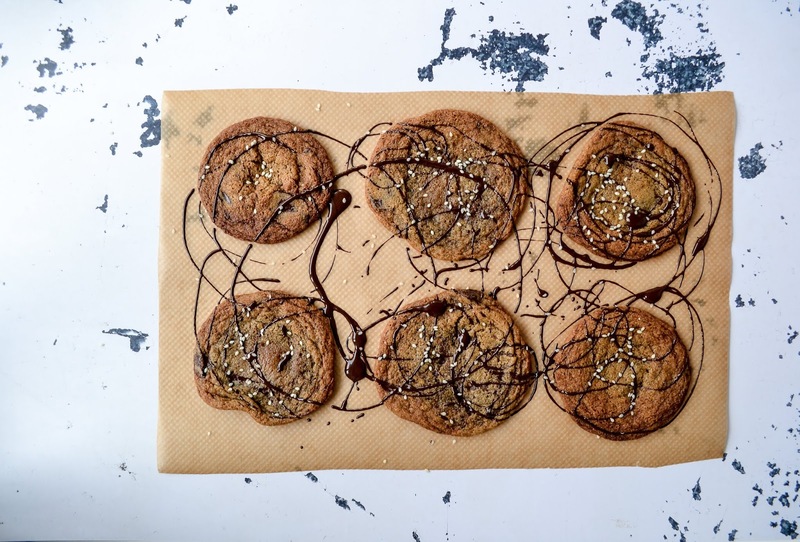 Once the chocolate is set, lift the cookies off the tray with a palette knife. Store in an airtight tin. This post was written is partnership with Bacofoil®, but all views are - as always - entirely my own.